Typhoid is a condition of enteric fever and an intestinal disorder. A diet plan plays a significant role in recovery, and it strengthens your immune system to fight against bacteria. It is mainly caused by a strain of bacteria called Salmonella typhi. Gastrointestinal discomforts, low appetite, and nausea are very common for typhoid patient. So it is good to take meals at small intervals, it helps your body to keep energetic and make able to fight bacteria. Try to increase protein intake and to avoid food which is high in fat & fibre and eat foods which are easy to digest. Besides, make sure that you wash your hands before eating. Typhoid fever can occur suddenly and gradually. It can cause several health issues including high fever, headache, abdominal pain, constipation, muscle pain, and weakness, loss of appetite and rashes on the neck and abdomen. If left untreated, it may last a month or more and could be life-threatening. Usually, it starts showing symptoms in the third or fourth week. For this reason, it is necessary for you to undergo treatment of typhoid fever. Once you recover from typhoid, you might still carry the bacteria. There will not be any symptoms, but do have the bacteria. The bacteria of typhoid adversely affect your digestive system and immunity. So, it is essential for you to maintain a proper diet plan to balance the electrolyte and fluid level in your body. Below is a list of foods that you should take while you are suffering from typhoid fever. 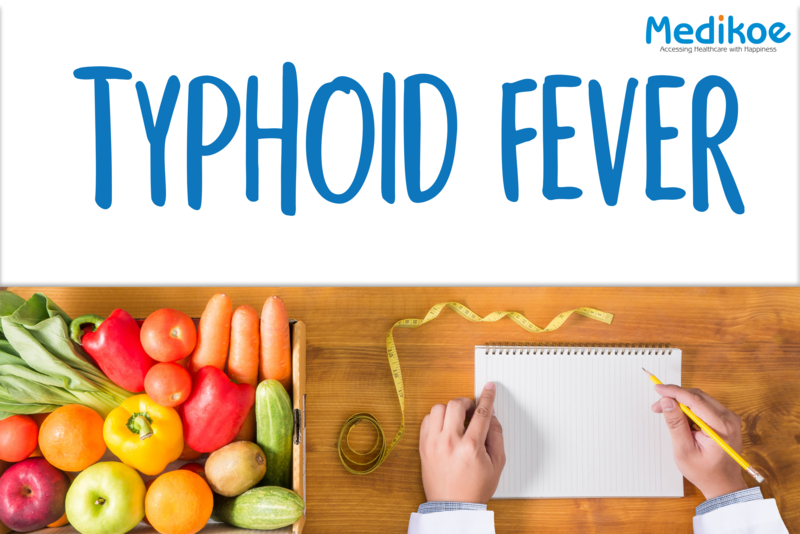 Read on to learn the proper diet you should follow during typhoid. If you are convalescing from typhoid, your doctor would recommend you to eat a high-calorie diet. Calories in your diet prevent your body against weight loss. Banana is loaded with higher amount of calories. Thus, make sure that you add banana to your diet during typhoid fever. Lemon juice is known to have countless nutritional benefits. If you are suffering from typhoid, lemon juice helps in boosting the immunity of your body to fight against the harmful bacteria and infections. Take a glass of lukewarm water by mixing one teaspoon of lemon juice because it is good for the digestive system. During typhoid, there is a loss of fluid from your body, and it is necessary to regain the fluid balance. Soups are nutritious and have a comforting effect. Tomato soup is best to take when you are suffering from typhoid fever. This is because; it is high in calories and gets digested quickly. Sometimes, especially during fever like typhoid, it is bit harder to digest milk or any kind of milk. Thus, buttermilk is one of the excellent herbal treatments for typhoid. Drinking buttermilk several times a day helps in strengthening your liver and improves your digestion power. Almonds in typhoid increase the flow of blood and help to regain weight loss due to typhoid. You can also have roasted chana, groundnut, and walnut. If a person is suffering from typhoid, it is good to include yogurt in your diet. It is a good source of protein which makes up for the deficiency of protein in your body. It is easier to digest yogurt. Thus, it improves the immune system and gives strength to fight bacteria. At least six to eight glasses of water should be consumed every day until your body temperature comes back to normal. Typhoid can lead to dehydration which can further cause many health complications. It is good to drink bottled water because the consumption of unsafe water can worsen the condition. Loss of fluid from your body during t helps to improve the immune system and also help to flush out harmful toxins. Typhoid affects digestive system due to diarrhea, so it is better to prevent insoluble fibre found in certain foods like skins and seeds of fruits and vegetables. Eggs: As it contains fat and could affect your weak digestive system. Meat: They contain more carbohydrate and liver needs to produce more bile to digest these foods. Spicy food: It is not suitable for the digestive system and could make typhoid worst. Fried food: It has a terrible effect on the liver and digestive system. Clarified butter: It is very tough to digest so avoid eating.